More detail on the UC Davis “Advancing Faculty Diversity Grant” has been posted. See Advancing Faculty Diversity | Academic Affairs. UC Davis received a grant from the UC Office of the president to run a pilot project involving faculty searches in each of eight campus entities. The searches are trying a new approach to screening faculty candidates where the first screening will focus on “Contributions to Diversity” statements from the candidates. As part of a campus-wide initiative to hire leading research faculty with a strong commitment to teaching, research and service that will promote the success of underrepresented minority students (African-American, Latino (a)/Chicano (a)/Hispanic, and Native American) and address the needs of our increasingly diverse state, UC Davis announces an assistant professor faculty position in the College of Biological Sciences. Applications are encouraged from candidates with a strong disciplinary background in computational biology, bioinformatics, modeling, bioinformatics, modeling, biostatistics or related discipline that will fit within one of the College’s departments. In addition to a strong record of research and teaching excellence, the successful candidate will demonstrate an understanding of the barriers preventing full participation of underrepresented minorities in higher education. The successful candidate also will have an accomplished track record (calibrated to career stage) of teaching, research or service activities addressing the needs of underrepresented minorities, and a clearly articulated vision of how their work at UC Davis will continue to contribute to the University’s mission of serving the needs of our diverse state and student population. Applicants’ track record of engagement and activity related to diversity, equal opportunity, and inclusion as well as their plans for future engagement will be a significant part of the overall evaluation of the candidate’s qualifications for a faculty appointment. Ph.D. or equivalent degree awarded by time of hire, where the topic of the work is in or related to computational biology, bioinformatics, modeling, biostatistics, or in biological sciences with demonstrated expertise in at least one of these topics. Excellence in research that complements or extends existing research strengths in the college and the potential to attract extramural funding. Evidence of commitment to or strong potential for commitment to the advancement of diversity, equity, and inclusion for underrepresented minority students and groups (African-American, Latino (a)/Chicano (a)/Hispanic, and Native American), and how this commitment integrates with teaching, research, and service. Commitment to excellence in teaching. Must demonstrate potential or evidence of ability to perform well at both graduate and undergraduate levels and to develop and teach undergraduate and graduate courses or seminars. Appointment will be as an academic year (9-month) tenure-track Assistant Professor. Applicants must have earned a Ph.D. or equivalent degree awarded by time of hire, where the topic of the work is in or related to computational biology, bioinformatics, modeling, biostatistics, or in biological sciences with demonstrated expertise in at least one of these topics. Participation in department, college, and university service is an expectation under our faculty shared governance model. We strongly recommend that all candidates visit our website dedicated to this search for additional information about how their application materials, including their Statement of Contributions to Diversity, will be used by the Search Committee in our screening and review process. The link is https://academicaffairs.sf.ucdavis.edu/advancing-faculty-diversity-pilot-project. For full consideration applications must be completed by February 28, 2019; the position will remain open until filled through April 30, 2019. Application packages should be submitted online through https://recruit.ucdavis.edu/apply/JPF02600 and should include the following documents: current Curriculum Vitae, cover letter, Research Statement, Statement of Contributions to Diversity, Statement of Teaching Accomplishments and Philosophy, and 3-6 letters of recommendation. Diversity, equity, and inclusion are core values of the University of California, Davis. Our excellence in research, teaching, and service can best be fully realized by faculty who share our commitment to these values, which are included in our recently developed Diversity and Inclusion Strategic Vision, our new strategic plan: “To Boldly Go,” our Principles of Community, the Office of Academic Affairs Mission Statement, and the UC Board of Regents Policy 4400: Policy on University of California Diversity Statement. Position description: The Department of Biological Statistics and Computational Biology at Cornell University (https://bscb.cornell.edu/) invites applications for a tenure-track position at the assistant or associate professor level in the area of Computational Biology, with an emphasis in population genomics, comparative genomics and/or functional genomics. The position will have responsibilities 70% in research and 30% in teaching on a 9-month academic year basis. Applicants will be expected to focus on developing and applying rigorous computational methods to large-scale data analysis in population, comparative, or functional genomics and will play a central role in the department’s program in research and teaching. Cornell is hosting a campus-wide expansion in genomics faculty recruiting, spearheaded by the Provost’s Task Force in Genome Biology. A cluster of 5 tenure-track faculty positions will be opening over the next 3 years at the Assistant or Associate Professor level. In addition to newly-hired faculty, faculty from several related departments will join the Department of Computational Biology, to be launched soon, and the Faculty of Computing and Information Science. Prior to the launch of the Department of Computational Biology, the successful candidate would also affiliate with the Department of Biological Statistics and Computational Biology. Cornell University has a broad teaching mission including introductory service courses in bioinformatics and more specialized and advanced courses for students in computational biology and related fields. The selected candidate will be expected to teach a 3 or 4 credit course each year and a 1-credit seminar course. Specific teaching responsibilities will be negotiated with the department chair as curriculum needs evolve. Qualifications: A PhD in computational biology, computer science, computational statistics, or a related field and a primary interest in understanding biological phenomena through the development and use of computational and statistical methods. Postdoctoral experience with a demonstrated record of productivity is required. Training in computer science or computational statistics, with experience in applications in population genetics, comparative genomics, functional genomics, or systems biology is expected. Outstanding applicants in all areas of computational biology will be considered, but research areas of special interest include comparative and population genomics; functional genomics; gene regulation; modeling dynamic cellular processes; and networks in biological systems. Salary and Benefits: Competitive and commensurate with qualifications and experience. An attractive fringe benefit package is included. Applications and Starting Date: Anticipated starting date is July 1, 2019 or as negotiated. Candidates should submit a cover letter, curriculum vitae, research and teaching statements, statement of diversity, equity, and inclusion and arrange to have three reference letters submitted to Academic Jobs Online at https://academicjobsonline.org/ajo/jobs/12365. Inquiries may be sent to Andrew Clark, Search Committee Chair, ac347@cornell.edu. Initial screening of applications will begin November 30, 2018 and continue until the position is filled. Please go to https://bscb.cornell.edu/ for information on the position and background about computational genomics at Cornell. Opportunity: The new faculty member will join a collaborative, interdisciplinary community on the main campus in Ithaca, New York. Cornell University is an innovative Ivy League university and a great place to work. Our inclusive community of scholars, students and staff impart an uncommon sense of larger purpose and contribute creative ideas to further the university’s mission of teaching, discovery and engagement. Cornell’s global presence includes the medical college’s campuses on the Upper East Side of Manhattan and Doha, Qatar, as well as the Cornell Tech campus on Roosevelt Island in the heart of New York City. Cornell University seeks to meet the needs of dual career couples, has a Dual Career program and is a member of the Upstate New York Higher Education Recruitment Consortium to assist with dual career searches. Visit http://www.unyherc.org to see positions available in higher education in the upstate New York area. The Cornell community embraces diversity and inclusion. We value AA/EEO, Protected Veterans and Individuals with Disabilities, and seek candidates who will create a climate that attracts persons of all races, ethnicities and genders. BEHAVIORAL EVOLUTION OR ECOLOGY, UNIVERSITY OF CALIFORNIA, DAVIS -The College of Biological Sciences, University of California, Davis invites applications and nominations for a tenure-track position in the Department of Evolution and Ecology at the ASSISTANT PROFESSOR level. Candidates must have a Ph.D. (or equivalent) in the biological sciences or related fields. We seek candidates with research interests that will complement and build upon existing faculty strengths in ecology and evolutionary biology; this may include but is not limited to the study of mechanisms of behavior, behavioral evolution using comparative methods, modelling, or the impacts of behavior on ecological processes. We welcome a broad spectrum of applicants, spanning diverse systems and approaches. We seek a colleague who is committed to participating in the departmental community through collaborative teaching, research, service and graduate mentoring and who will embrace UC Davis’ Principles of Community. Letters of recommendation should specifically address this aspect of the application. The successful candidate will be expected to teach in undergraduate and graduate programs, and should be committed to mentoring and fostering diversity. Applicants should submit materials online at https://recruit.ucdavis.edu/apply/JPF02427 which contains additional information about the position. The application should include: curriculum vitae, description of current and projected research, summary of teaching interests and experience, and three publications. Applicants should also provide contact information for three referees. Once entered, referees will be prompted by email with upload instructions for their letters. Open until filled, but all application materials, including letters of recommendation, must be received by November 5, 2018 to assure full consideration. Faculty contact: Gail Patricelli (gpatricelli@ucdavis.edu). Administrative contact: Korie Martinez (kmartinez@ucdavis.edu). The University of California is an affirmative action/equal opportunity employer committed to excellence through diversity and strongly encourages applications from all qualified applicants, including women and minorities. UC Davis is responsive to the needs of dual career couples, is dedicated to work-life balance through an array of family-friendly policies, and is the recipient of an NSF ADVANCE Award for gender equity. The Department of Plant Sciences in the College of Agricultural and Environmental Sciences at the University of California, Davis is recruiting an academic year (9-month), tenure-track Assistant/Associate Professor of Grassland Ecology and Management. Grasslands represent some of Earth’s most expansive and diverse biomes, supporting the livelihoods of millions of people. Grasslands are sensitive to the interacting drivers of climate, grazing, and fire – and to human alteration of these natural disturbance regimes, as well as the introduction of invasive species. The conservation and sustainable use of these ecosystems in the face of rapid environmental and socio-economic change is a central challenge on the global scale. We are seeking applicants interested in the broad study of grassland ecology to address a suite of fundamental challenges to the sustainable management of grasslands across the globe. All aspects of grassland ecology and management are of interest and will be considered in this recruitment. We are seeking a candidate interested in productive collaborations across disciplines and with grassland stakeholders. We are seeking a candidate interested in developing a dynamic grassland ecology and management teaching program at both the undergraduate and graduate levels. The successful candidate will have the opportunity to teach Ecology of Grasslands and Grazed Ecosystems (Revised PLS 135) and contribute to Principles of Rangeland Management and Ecology (PLS 130). In addition, the candidate can teach at the graduate level within their area of research expertise and contribute to graduate programs in the Ecology, International Agricultural Development, Horticulture and Agronomy graduate groups, and/or other graduate programs of interest to the individual. Ph.D. or equivalent in ecology, rangeland science, plant sciences, or a related discipline. Demonstrated potential for excellence in research and instruction on topics relevant to grassland ecology and management. The position will remain open until filled. To ensure consideration, applications should be received by 23:59 PDT October 31, 2018. Required application materials include: 1) curriculum vitae including publication list, 2) up to three publications, 3) transcripts if the applicant is within five years of Ph.D. degree completion, 4) statement of research accomplishments, 5) statement of teaching accomplishments and philosophy, 6) statement of future research plans relevant to this position, 7) statement of contributions to diversity, and 8) the names, addresses, including e-mail, of four professional references. 9) Authorization to Release Information form. Additional inquiries should be directed to Marie Jasieniuk (masjasien) Chair of Search Committee, or Gail Taylor (gtaylor) Chair of Plant Sciences. 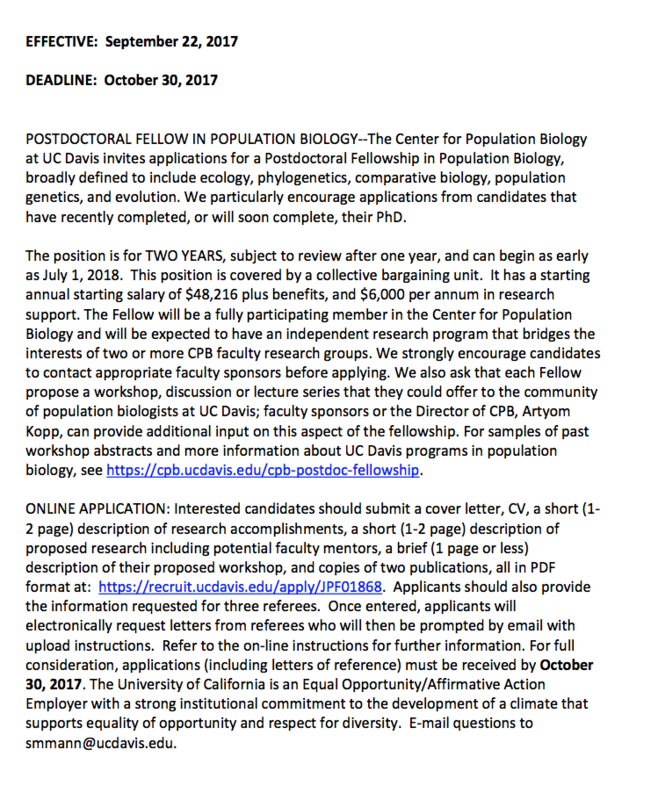 POSTDOCTORAL FELLOW IN POPULATION BIOLOGY — The Center for Population Biology at UC Davis invites applications for a Postdoctoral Fellowship in Population Biology, broadly defined to include ecology, phylogenetics, comparative biology, population genetics, and evolution. We particularly encourage applications from candidates that have recently completed, or will soon complete, their PhD. The position is for TWO YEARS, subject to review after one year, and can begin as early as July 1, 2019. This position is covered by a collective bargaining unit. It has a starting annual starting salary of $49,188 plus benefits, and $6,000 per annum in research support. The Fellow will be a fully participating member in the Center for Population Biology and will be expected to have an independent research program that bridges the interests of two or more CPB faculty research groups. We strongly encourage candidates to contact appropriate faculty sponsors before applying. We also ask that each Fellow propose a workshop, discussion or lecture series that they could offer to the community of population biologists at UC Davis; faculty sponsors or the Director of CPB, Artyom Kopp, can provide additional input on this aspect of the fellowship. For samples of past workshop abstracts and more information about UC Davis programs in population biology, see https://cpb.ucdavis.edu/cpb-postdoc-fellowship. POSTDOCTORAL FELLOW IN POPULATION BIOLOGY–The Center for Population Biology at UC Davis invites applications for a Postdoctoral Fellowship in Population Biology, broadly defined to include ecology, phylogenetics, comparative biology, population genetics, and evolution. We particularly encourage applications from candidates that have recently completed, or will soon complete, their PhD. The position is for TWO YEARS, subject to review after one year, and can begin as early as July 1, 2018. This position is covered by a collective bargaining unit. It has a starting annual starting salary of $48,216 plus benefits, and $6,000 per annum in research support. The Fellow will be a fully participating member in the Center for Population Biology and will be expected to have an independent research program that bridges the interests of two or more CPB faculty research groups. We strongly encourage candidates to contact appropriate faculty sponsors before applying. We also ask that each Fellow propose a workshop, discussion or lecture series that they could offer to the community of population biologists at UC Davis; faculty sponsors or the Director of CPB, Artyom Kopp, can provide additional input on this aspect of the fellowship. For samples of past workshop abstracts and more information about UC Davis programs in population biology, see https://cpb.ucdavis.edu/cpb-postdoc-fellowship. ONLINE APPLICATION: Interested candidates should submit a cover letter, CV, a short (1- 2 page) description of research accomplishments, a short (1-2 page) description of proposed research including potential faculty mentors, a brief (1 page or less) description of their proposed workshop, and copies of two publications, all in PDF format at: smmann. The Biological Sciences Department at California State Polytechnic University, Pomona (Cal Poly Pomona) is inviting applications for a tenure-track, ASSISTANT PROFESSOR position in Host-Pathogen Interactions, beginning August 2018. As Chair of a Department with a leading program in microbiology, we hope that you can distribute our faculty search announcement. The enclosed announcement describes the position, the qualities we are searching for in a candidate, and information on how to apply. We would appreciate your assistance in finding qualified applicants. The University and this Department are especially interested in contacting women and applicants from disadvantaged socio-economic backgrounds, but applicants from all backgrounds are eagerly sought. Please post and distribute the enclosed announcement to anyone you think may qualify and be interested in the position. Although we are including information on our Department below, further information may be obtained by writing or by calling the Biological Sciences Department at (909) 869-4037/4038. Our Fax number is (909) 869-4078. For more information about the university, college and our department, you can access the webpage at http://www.cpp.edu/~biology. Thank you very much for your assistance.